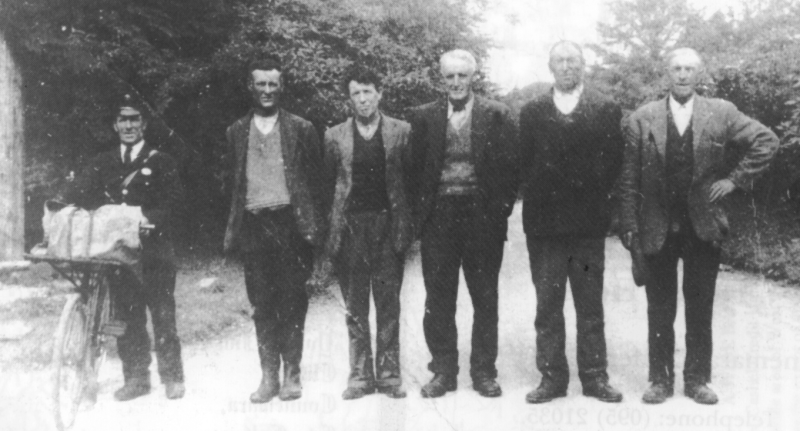 The postman on the ‘Avenue’ at Ballynahinch Castle: Petie Walsh (postman), Josie Flaherty, Martin Halloran, Jimmy Keane, Tom Joyce and Martin Lydon. In the 1930s the pension was about seven shillings, rising to about £1 by 1950. The pension money usually arrived out every Wednesday from Galway in a small canvas bag. There would have been about £12 in it in the late 1940s rising to about £25 by the late 1960s. At one time I was servicing about twenty old age pensioners and this made Friday a very busy day. Now there are only four pensioners left in the village. I was not authorised to issue money orders because my post office was deemed to be too small. Postal orders never exceeded £1 in the early days, at a cost of one penny to the customer. Stamps cost 2p each and it remained that way until the late 1950s. There have been many famous stamps over the years but my favourites were always those that depicted wildlife. I used to charge 5p for a registered letter although at that time they would not get to Galway city any quicker than an ordinary letter, which was very frustrating for the sender. There was a standard charge of one shilling per telegram in the 1930s, but by the time I took over telegrams were priced on the basis of so much a word. I would ring the message through to Clifden post office and they would send it off from there. The first telegram I ever sent was for Mrs Brooks in Errislannan Manor. On average, I would probably have only sent out about ten telegrams per year in the ’40s and ’50s. I received no money for incoming telegrams. I was able to identify by the number of rings whether an incoming call was meant for Errislannan, Ballinaboy, Ballyconneely or Roundstone. One of the main services I gave in those years was delivering messages that came in by telegram to people in the locality. Very often the message had to do with somebody having died, either in Galway hospital or perhaps in England or America. I sold a lot of dog licences. It was customary for a guard to visit the village at least one a year to check that all dogs were fully licensed. The dog licence fee was five shillings as was the wireless licence, which came in during the 1950s. TV licences arrived in the 1960s and it is hard to believe that they now cost £70. I found that saving stamps did not really catch on in Errislannan until the late 1960s.